If you regularly pop by my website, you might remember that a few weeks ago I wrote about Grace Culhaci, a British-born, Australian based entrepreneur who founded Zk’in skincare. Well, as promised, now is the time for the review of some of her products that I have been testing since September. 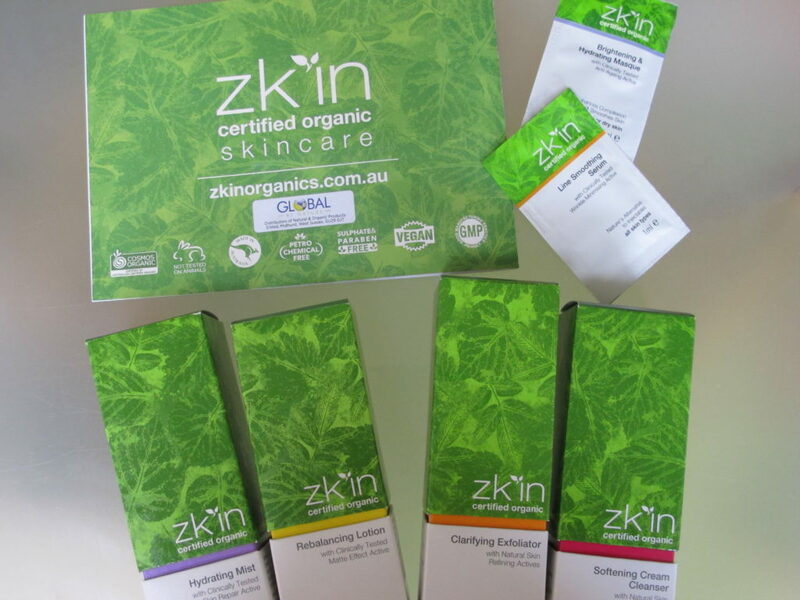 Zk’in is a fairly new Australian-born range ( the factory is based in Sydney ) for the UK shores & comprises 12 self-select products to address different skin concerns for different ages, ‘from teens to your wiser years’, according to Grace. When it comes to Zk’in skincare Grace believes in having a holistic approach with the clinical feel. Each product is gentle but has powerful bio-actives formulations. Grace is firmly adamant that if a person is an avid smoker who occasionally pops into health stores to look for the latest supplements then Zk’in is definitely not for him or her. Our lifestyle determines our health, as well as the health of our skin on many levels – ignoring it and using the right skincare won’t solve pre-existing problems. Zk’in skincare has products for Oily/Combination skin; Normal/Dry skin; Sensitive skin & Anti-ageing treatment products suitable for all skin types. This cleanser was developed to deeply cleanse your skin without stripping it of its normal moisture levels. One of the product’s star ingredients, Rosehip Oil, nourishes & supports skin’s suppleness, while Organic Aloe Vera will help to rehydrate, calm and firm your skin. Squeeze some cleanser on your fingers and work it gently into your skin ( make sure you avoid the eye area ). Remove it with the cotton pad, then re-apply again massaging the contours of your face in a circular motion, from the outside in and then wash it off with warm water. Don’t expect this cleanser to lather ! When you apply this light cleanser to your face & then add water, the formula ( a mixture of gel and lotion texture ) transforms into milk-like one. Once you wash it off your skin feels pleasantly cool to the touch, soft and really fresh, as if you have taken a plunge into the lake in the morning. The feel of my skin, particularly when used in the morning, reminded me of the feel of my skin in my 20s. I am not saying the clock were turned back but I certainly appreciate a product that makes me feel good about the state of my skin. Another note-worthy point is that the cleanser doesn’t contain alcohol, which generally have a very dehydrating effect on the skin. Clarifying Exfoliator will help to clear your pores of environmental debris to which we are exposed daily, thus assisting the process of improving your skin’s texture & refining the size of the pores. It will also help to remove excess oil. Organic Arabica Coffee Beans ( don’t you just love a perfect, freshly brewed cup of black coffee in the morning ?) will polish your skin, while its Caffeine content will alleviate puffiness and redness by helping to improve capillary tone. Added to that there is Colloidal Oatmeal which is widely known for its natural anti-irritant qualities. If you have dry or oily/combination skin, you are advised to use this product twice weekly; it is up to you whether you want to do it in the morning or at night-time. Massage over clean skin, avoiding your eyes and lips, keep it on for two minutes and then rinse off with warm water. If you have sensitive skin, use it once a week, by applying it as a mask to your clean face and keeping it on for two minutes, again avoiding eye and lip areas, and then wash it off with warm water. The texture of this product is a mixture of gel and ground coffee and its uplifting smell of coffee and Mandarin are a great way to start the day without actually drinking it. The granules are quite large and I found that this product works wonders for my hands, which are also starting to feel the cool temperatures outside. Unlike larger grain scrubs, the ones in Zk’in cleanser don’t scratch the skin and once you wash it off your skin will be soft, refreshed and even in tone. One of the elements that ages & damages our skin is UV light radiation, so Zk’in Hydrating Mist will help you counteract that with daily use. Organic Fucoidan Extract (Maritech Bright) promises to reduce redness after UV exposure by 50% after just two hours, as well as reduce surface water loss to improve skin moisturisation by 25% ( when compared to a control group during the clinical trials ). It works in combination with organic Aloe Vera, which is considered to be one of the most nutritionally alive plant foods on the Planet. Shake the toning mist canister and spray your face & neck in the morning and evening, after cleansing, and then gently press it into your skin. I find doing it this way quite therapeutic, extending the pleasure of some brief but necessary ‘me-time’. The refreshing plant smell and the sensation of refreshed skin is a particular delight now, when the heating is on but I certainly look forward to using this mist in the summer, when frolicking on the beach or by the swimming pool. it is also nice to carry it around in your handbag, space permitting, to refresh your skin when on the tube, plane, train or working in the office. Ingredients: Aloe barbadensis (Aloe vera) leaf juice*, Lavandula angustifolia (Lavander) flower water*, Leuconostoc/Radish root ferment filtrate, Glycerin*^, Parfum (natural preservative), Fucus vesiculosus (Brown seaweed) extract*, Lavandula hybrida (Lavandin grosso) oil*, Linalool#, Vanilla planifolia (Vanilla) fruit extract*, Cananga odorata (Ylang Ylang) flower oil*, Pogostemon cablin (Patchouli) leaf oil*, d-Limonene#, Benzyl benzoate# (natural from Ylang Ylang), Geraniol#, Coumarin#. (*certified organic, ^palm oil free, #natural component of essential oil). 97.45% organic. Those of us that have combination skin know that one of the concerns that accompanies it is excessive shine which noone wants to have. With that problem in mind, Grace chose to include an active ingredient derived from plant-based marine biotechnology ( EPS Seamant ) that has been clinically tested to create a matt effect. According to the study results published on zkinorganics.com.au it helps to reduce shine within one hour of lotion application to the skin and promises to last until the end of the day. I asked a friend of mine to test this statement for me and she told me that after a couple weeks’ use she noticed that her skin looked more matt and she happily stopped re-applying powder to her face during the day. The lotion itself is very light in texture, with a slightly gel feel to it as well. It has a flowery, uplifting smell with notes of Mandarin, Bergamot, Ylang Ylang and Frankincense essential oils. In my experience a little bit of it goes a long way when it comes to applying it to the skin. There is organic Macadamia Oil, which is rich in Vitamins including Vitamin E that our skin matrix adores ( it helps reduce inflammation) and Vitamin A ( decreases skin thickness and oil gland congestion ). Grace also took into consideration the scientific fact that our hormones ‘peak’ at midday thus affecting our skin metabolism in a certain way when it comes to sebum production. What is quite unique about Zk’in skincare is the way that Grace approaches her brand, no detail is too little to escape her attention. A lot of cosmetic packaging contains metallized particles, which prevents it from being fully recyclable. Grace managed to find a way to solve this, using a process unique to Australia, without compromising on the premium and unique feel of Zk’in packaging – it really is a pleasure for the eye without damaging the environment. Grace focuses on affordability and not being gimmicky and an important part of her vision for the brand is creating a positive legacy through the ‘Honest Beauty’ marketing campaign & choosing her suppliers carefully. Zk’in is COSMOS Organic Standard Certified, is free from BPA, sulphates, GM ingredients & Nano Particles, is suitable for vegetarians and has been dermatologicaly tested & approved. UK stockists included LoveLula.com and xynergy.co.uk Products are priced between £9.95-£39.90.